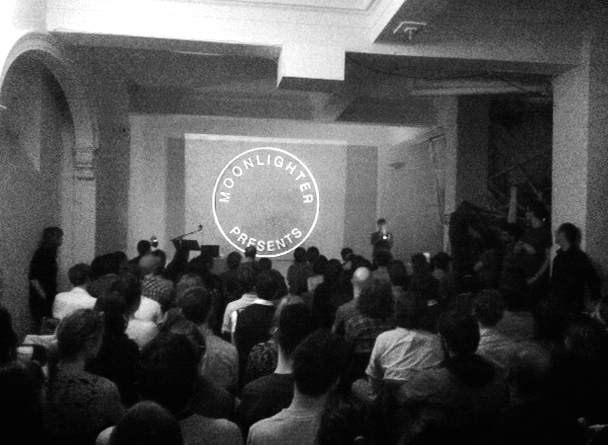 The Clocktower Gallery hosts the ninth installment of Moonlighter Presents, a nomadic lecture series organized by Stephanie DeGooyer and Justin Martin. Three speakers lecture briefly on topics that extend beyond their “official” qualifications: Ned Beauman speaks about his fascination with kings whose reigns lasted less than twenty minutes; R.H. Lossin discusses the strange and complicated relationship between Nazis and contemporary digital librarianship; and Jonah Corne explores deadpan and other fantasies of neutral face expression. Between the second and third speaker, Kelly Pratt of Bright Moments offers a brief musical interlude. 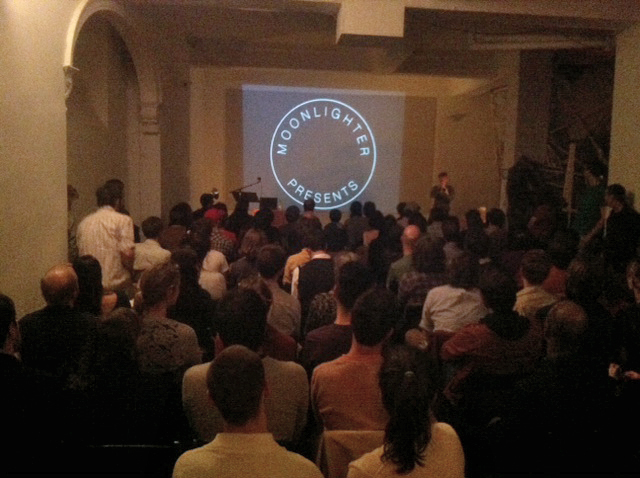 Moonlighter Presents is a New York-based lecture series dedicated to non-expertise and the art of public speaking. Founded in September 2010, the series evolved as a reaction to the increased emphasis on professionalization in academia and the art world. Scholars and professionals are invited to address topics outside their fields of expertise or to consider their work from unusual perspectives. There are no topics or themes. Participants are free to invent roles for themselves and to tamper with traditional lecture formatting. Lectures have, for the most part, been held in an old funeral home in Williamsburg. They have also taken place in other non-traditional speaking venues, such as a former Catholic high school in Soho, a bar in Greenpoint, and a corporate law firm in Manhattan. Ned Beauman is the author of Boxer, Beetle, winner of the UK Writers' Guild Award for Best Fiction Book and the Goldberg Prize for Outstanding Debut Fiction. He was born in London and currently lives in New York. R.H. Lossin is a librarian and writer living in Brooklyn, New York. She has written for The Nation, The Brooklyn Rail, and New York Arts Magazine. Jonah Corne teaches film studies at the University of Manitoba, in Winnipeg, Canada. His most recent essay, "Gods and Nobodies: The Extra, The October Jubilee, and Josef von Sternberg's The Last Command," appears in a special issue of Film International devoted to late Hollywood silent film melodrama. Kelly Pratt is best known for his brass work with Beirut, Arcade Fire, and LCD Soundsystem, among others. He can currently be heard busking about with his new band Bright Moments, who recently released their debut Natives on the Luaka Bop label. This program is made possible with support from the Clocktower Gallery Board of Directors, and with special gifts from Charles Carberry, Robert Gaffey, Wesley Johnson, Ronald Winston, and Fredrick Sherman. 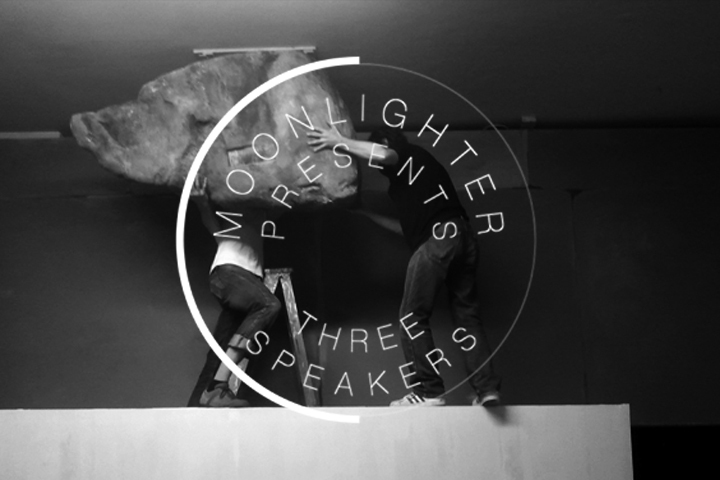 Moonlighter Presents is a nomadic New York-based lecture series dedicated to non-expertise and the art of public speaking. Founded in September 2010, the series evolved as a reaction to the increased emphasis on professionalization in academia and the art world. 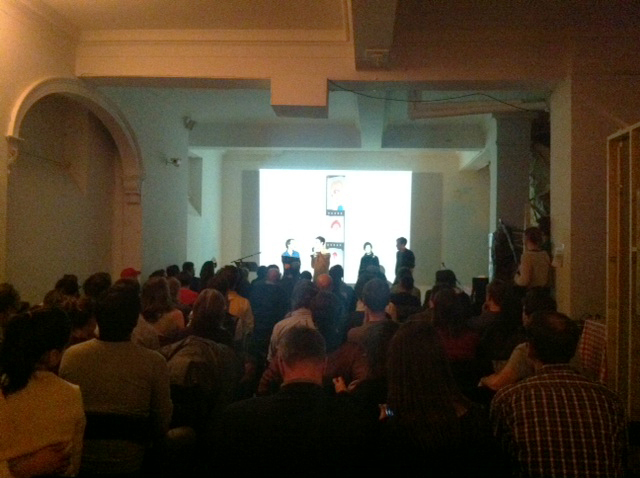 The lectures have taken place in a variety of non-traditional speaking venues, such as an old funeral home in Williamsburg, a former Catholic school in Soho, a bar in Greenpoint, and a corporate law firm in Manhattan. On Tuesday, April 24th, the Clocktower Gallery hosted Moonlighter's most recent installment, the ninth in the series, organized by Stephanie DeGooyer and Justin Martin. Three speakers lectured briefly on topics that extend beyond their “official” qualifications: Ned Beauman speaks about his fascination with kings whose reigns lasted less than twenty minutes; R.H. Lossin discusses the strange and complicated practice of destroying literature to preserve it; and Jonah Corne explores deadpan and other fantasies of neutral face expression. Between the second and third speaker, brass musician Kelly Pratt of Bright Moments offered a brief musical interlude.